Fire Update: Lost Many Cameras, 20 Boxes. No One Hurt. * No one was hurt. * Lost a 130 sq meter side-building (1300 sq feet) that held scanning equipment. We operate 30 scanning centers, and this was one of them. Our offices were not affected. * We lost maybe 20 boxes of books and film, some irreplaceable, most already digitized, and some replaceable. From our point of view this is the worst part. We lost an array cameras, lights, and scanning equipment worth hundreds of thousands of dollars. Insurance will cover some but not all of this. * We do not know the cause, but there is no evidence of foul play. * An outpouring of support has lead to over 1500 donations totaling over $60,000 in the first 2 days. We also have received new offers to digitize more materials that will help keep our staff working. This is so helpful. Thank you for your confidence and support in our mission. * No servers were affected. If some had been damaged, we have backups in different locations. An electrical conduit was damaged, but all digital services were functional within 6 hours, fully operational in 10 hours. * All employees of the scanning center were back scanning again, using repurposed equipment, within 48 hours. Our administrative and computer operations staff have worked hard to get life back to some sort of normal for everyone. We are rattled, but back being productive. The side of our neighbor’s building was damaged so the tenants will be disrupted until that is repaired. * Despite the fire, we were able to hold a pre-planned event celebrating the birthday of Aaron Swartz 3 days after the fire. All in all we were lucky, and we are very thankful for the support from everyone. While rattling to have a fire, and expensive, we have had little significant operational disruption. We are looking for lessons to learn and will apply them. Lets keep making copies– a key towards preservation and access. 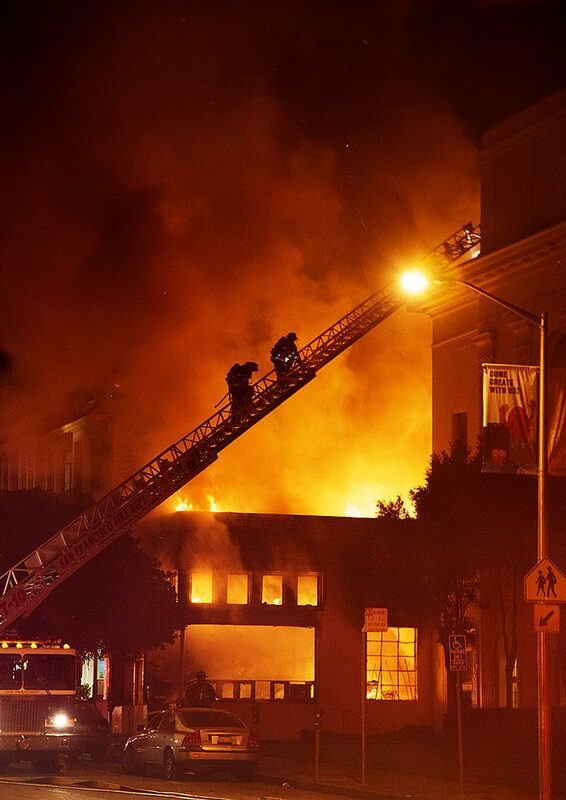 This morning at about 3:30 a.m. a fire started at the Internet Archive’s San Francisco scanning center. The good news is that no one was hurt and no data was lost. Our main building was not affected except for damage to one electrical run. This power issue caused us to lose power to some servers for a while. Some physical materials were in the scanning center because they were being digitized, but most were in a separate locked room or in our physical archive and were not lost. Of those materials we did unfortunately lose, about half had already been digitized. We are working with our library partners now to assess. 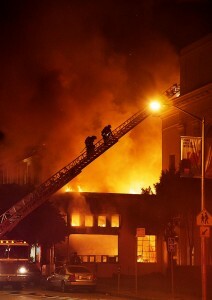 The San Francisco Fire Department was fast and great. Our city supervisor and a representative of the mayor’s office have come by to check up on us. There has been a pulling together on the Internet as news has spread. This episode has reminded us that digitizing and making copies are good strategies for both access and preservation. 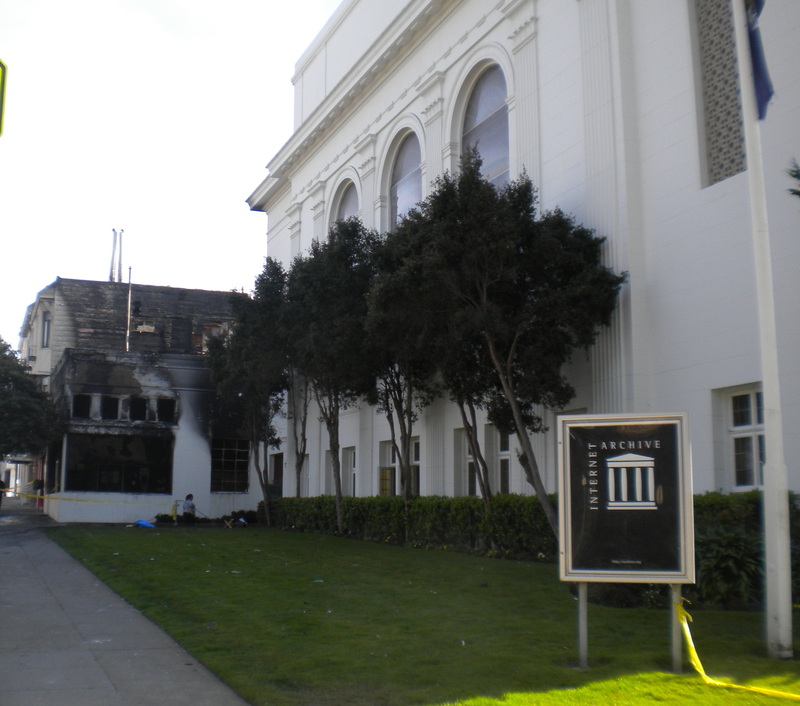 We have copies of the data in the Internet Archive in multiple locations, so even if our main building had been involved in the fire we still would not have lost the amazing content we have all worked so hard to collect. An early estimate shows we may have lost about $600,000 worth of high end digitization equipment, and we will need to repair or rebuild the scanning building. It is in difficult times like these that we turn to our community. What help could we use? Funding. Your donations will help us rebuild the scanning capabilities in books, microfilm, and movies. Scanning. The employees affected by the fire will need continued digitization work at our alternate location while we recover. This entry was posted in Announcements and tagged Scanning Center Fire. Bookmark the permalink. 124 Responses to Fire Update: Lost Many Cameras, 20 Boxes. No One Hurt. I’m so glad you’re safe. I live in Algeria and I want to help and donate though our currency is not convertible. Let me know if there is a solution. Thanks a lot for your great work. Bitcoin donations are accepted; maybe you can find a local person willing to sell you some bitcoins. Hi, you could try donating through Bitcoin; some exchanges are listed at http://howtobuybitcoins.info/dz.html, there is probably at least one you could use. The Bitcoin address is listed on https://archive.org/donate/bitcoin.php. I have clean-up, building repair and painting skilz. Can I offer some assistance? Very sorry to learn of this. I would be willing to mount a benefit film/video screening, at our ATA Gallery here in San Francisco, to raise re-building funds. Maybe something in that period between Christmas and New Years. Most kind offer– that would be very helpful and great fun (good combination). Maybe some of the digitized films could be in the mix somewhere. I’m an SF local and would certainly be willing to help clean up if needed. Brewster, I attended a David Isenberg event at your wonderful site a few years ago. Our firm will send out a $1000.00 check as a donation to help with efforts. If there is anything we can do from our fiber network in Albuquerque please let us know. We also have some dark fiber assets in the Bay Area that could be be brought into the mix,…. Donation sent, so sorry to hear about it. SF feels like a second home to me, and the Wayback machine has been of incalculable value to my PhD research and my teaching. I am sad to read this unfortunate news. The Internet Archive is an unqualified public good. Despite the passage of years and disclosures (and my own avid curiosity), your preservation work and reputation remain flawless. Thank you for your generosity, and all that you do for us. 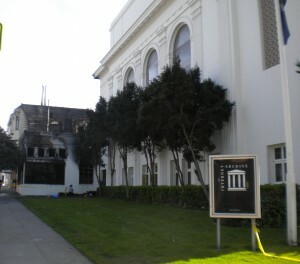 Given the intensity of the fire, it is fortunate that there was no structural damage to Internet Archive offices! You confirmed that, yes? Also, do you have insurance to indemnify you for losses due to fire? If not, you should, for the future. If you are covered by a current policy, but are encountering difficulties in filing a claim, I would be happy to assist. I am not an attorney, nor an insurance professional, but I have a passing familiarity with such matters. If necessary, I can ask my mother to help; she knows how to work with recalcitrant adjustors. Please, do not hesitate to ask, okay? The arsonists of Alexandria strike again. Since I am just 16 years old, I don’t have any money but I am trying to raise funds through the local clubs and organisations. 1. )electronics and strong lights – fire? upgrade their equipment. the older equipment is given to you. question: how high a voltage is there at equipment one??? any banner to redirect people to donation page? Pingback: How I Became Homeless. This is for my generation, a generation that demands justice. | It was "buy one, get one free." Heard about the fire from Tom Foremski’s piece at SVWatcher.com, and have been a fan of the “good ole” Wayback Machine since … wayback. It’s painful that we have to consider this at all, but will there at least be public record of what was both irreplaceable AND undigitised? As a 64 Years Old Book Worm with Bad Eyes; the archive TALKING BOOKS and POETRY readers are VITAL and a God-send. I got NEW Glasses Nov.4, makes me Eyes Hurt Wost, when reading. I will send donation, will be small, but IMPORTANT to ME are Thee & THine! It will be useful if the Archive dot org, will put up a list of damaged/irretrievable books, because someone may have a copy in a private collection, that they would, or could lend or even send in a scanned copy of their own to the “Archive”. Most people have an all-in-one printer scanner or a scanner of sorts and can do it, or could maybe send an original hard copy, or even an old fashioned Xerox would be better than nothing. So sorry to hear about it, But happy because nobody suffer, how can I help, I’m too far from U S A and Archive my second home. god preserve you. This is a sad situation would love to help,But unable right now,GOD’s blessings go with you always. I would like to add my voice to those of Wyatt (Nov 13) and Copycat (Nov 18) above: even a list of what is irreplaceable and undigitised is better than nothing at all. There were about 20 boxes of printed materials and films that belonged to our scanning partners. From replaceable texts to irreplaceable home movies. Most were digitized already, which helps somewhat. I don’t think it is our place to further describe these, but rather our partners are addressing how to handle their loss. Being that these were under our care is quite a burden. On a more positive note, compared to what could have been lost, we were very fortunate– even in the scanning center there were much more that were in a storage room that was not significantly damaged. There were also books that the archive owned. These came from the used book trade, which are particularly available so are not a real loss. No data was lost and no one was hurt. Hope this helps and thank you for the support.